If the North Pole loses its summertime ice, precipitation in the state could drop by up to 15 percent. Extent of Arctic sea ice in September 2016 versus the 1981-2010 average minimum extent (gold line). Credit: NASA. Melting ice in the Arctic might seem a world away from California’s farms and aquifers. But droughts in the state could get worse as the Arctic melts. 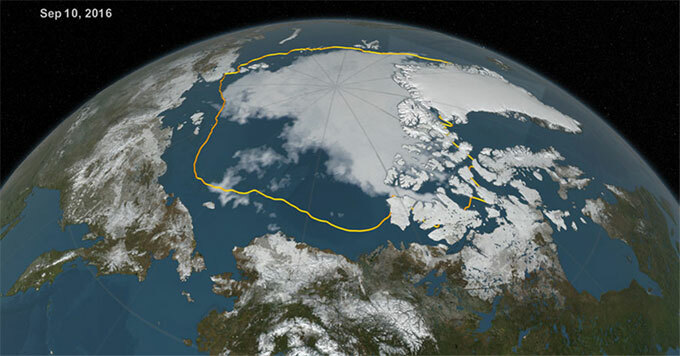 Summers in the Arctic Ocean are expected to be ice-free within a few decades. When that happens, the precipitation California receives could decrease as much as 15 percent. Ivana Cvijanovic is with the Lawrence Livermore National Laboratory. She says when sea ice melts, the Arctic Ocean warms, causing atmospheric changes that affect how heat circulates in the tropics. That helps create atmospheric high pressure over the North Pacific, which pushes winter storms away from California. So, a state that already struggles with drought could become even drier. She says sea ice is one of many factors that will shape weather patterns as the climate warms. More research is needed to understand how the factors will interact. But it’s clear that melting ice will have an impact far beyond the poles.